Cienfuegos' Historic Centre- Park Marti | Travel? Yes Please! Cienfuegos was just a quick stop on our excursion to Trinidad, but as soon as I stepped off the bus, I was wishing we could stay at least a few hours. A UNESCO World Heritage Site, Cienfuegos was lovingly nicknamed in colonial times the “Pearl of the South”. The seaside city still retains much of its colonial delight, thanks in part to a well preserved historic centre. As the centre of Cienfuegos, Parque Marti is revered both for its historical importance and symbolic significance. The establishment of Cienfuegos was quietly celebrated here, under the hibiscus tree chosen as the marker for laying out the city’s first 25 blocks. Inlaid in the cement of this former parade ground is a compass rose, called the “zero kilometre”, marking the central point of Cienfuegos. Lions on marble pedestals flank the entrance to the park, framing a monument in the distance dedicated to Cuban national hero, José Martí. José Martí was a writer, poet and revolutionary philosopher. Further down the path, at the west end of the park, stands Cuba’s only triumphal arch. 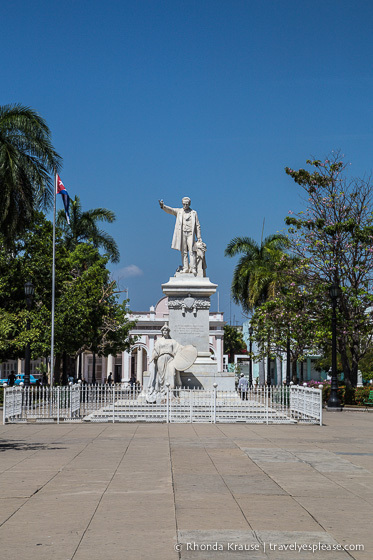 Commissioned in 1902 by the local workers’ corporation, it commemorates the creation of the Republic of Cuba. Parque Marti is surrounded by many important, historical buildings, another reason why the plaza has been declared a national monument. This elegant building is said to be modeled after the Capitolio in Havana. It is home to the provincial government assembly. Cienfuegos’ cathedral was built from 1833-1869. It features two bell towers, of differing heights, French stained glass windows and a Neoclassical façade. Tomás Terry Adams was a wealthy sugar factory owner who later became mayor of Cienfuegos. It was in his last will and testament to have this Italian-style theatre built after his death. World famous singers, such as Italian tenor Enrico Caruso, performed here. Another Neoclassical building, this school was built thanks to a generous donation from Nicolás Jacinto Acea, an academic who valued accessible education for all. This palacio was built in the early 1900s by sugar magnate José Ferrer Sirés. Rumour has it that Enrico Caruso stayed here when he performed at Teatro Tomás Terry. Cienfuegos is located in west-central Cuba on the southern coast. It is 250 kilometers from Havana.